Thank you all for your loveliness about yesterday’s exertions. I’m hoping that tomorrow I will haul myself out without throwing a strop first. Tonight I decided to consult one of my yoga books for inspiration (Essential Yoga since you ask) (other book sellers are available, although it’s only showing up as available on Kindle) and found a whole session building up to the sun salutation. What I learned from this is that it’s a lot easier having someone give you verbal instructions than trying to figure it out from a book. There was a lot of flicking between the overall plan and the instructions for the individual postures, which did not make for flowing practice. There was also a lot of “oh, so that’s what that’s called” and some sighs of relief when I reached a pose that I’m familiar with. All in all, about half an hour. And in the absence of some soothing music, I had the background noise of pouring rain with occasional thunder. I am glad you didn’t go running in that! 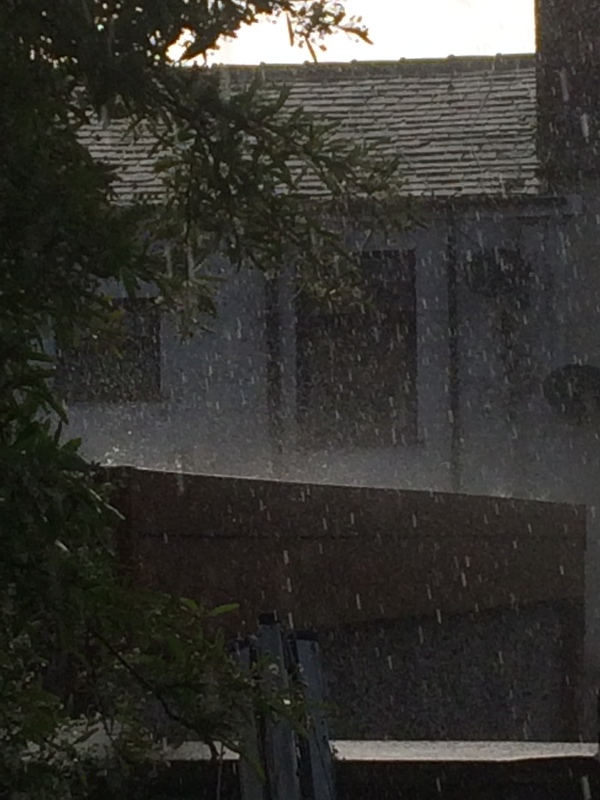 Knowing how rain never seems to come out properly on photos…I can see that!